1Institute of Agricultural Resources and Regional Planning, Chinese Academy of Agricultural Sciences, Beijing 100081, China. A major challenge facing China is to meet the increasing food demand of its growing population in the face of decreasing arable land area, while sustaining or improving soil productivity and avoiding adverse environmental impacts from intensive agriculture. 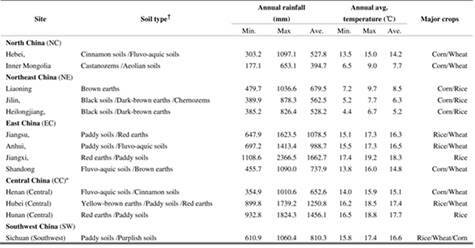 Soil productivity is the ability of a soil to support crop production, generally measured in terms of yield (Brady, 1974), and is determined by the interaction of soil physical, chemical and biological attributes (Roy et al., 2006). Also, soil productivity was defined as “the capacity to grow a particular plant or plant sequence under a specified management system” (Pierce et al., 1983), and could be assessed by singlefactor, multi-factor or simulation models by using soil physical and chemical properties (Duan et al., 2009). In China, productivity of two-thirds of the arable land is restricted to below the mid-range (Zhou, 2013), because of a range of soil problems, climate factors, management constraints linked to economic development, and increased land-use intensity (Shi et al., 2010; Zhou, 2013). With the development of industrialized agriculture, China’s agricultural intensification has also greatly increased the volume of production, but has forced farmers to increase land use intensity. Intensification has placed increasing pressure on the land, leading to over-use of marginal lands for food production, excess tillage, over-cultivation on the limited croplands that have high potential for multiple cropping, but also increased use of fertilizer inputs often resulting in negative environmental impacts (Liu and Diamond, 2005). The soil nutrient surplus in China has been increasing since the 1980’s, particularly in the more developed southeastern provinces (Shen et al., 2005), with the major cereal-producing provinces such as Shandong, Henan and Sichuan maintaining high fertilizer inputs over time (Liu et al., 2009). In these regions, fertilizer applications are often far greater than crop demands, leading to excess soil nutrient accumulation, especially higher nitrogen (Darilek et al., 2009). Positive nutrient balances can build up soil fertility and enhance soil productivity, but can also decrease agronomic fertilizer-use efficiency, and increase the risk of fertilizer loss and potential environment impacts (Peng, 2011). Some suggest that intensive use of arable land will be required in the future to ensure food security in China (Zhou, 2013), but it must be coupled to sustained soil productivity and environmental quality. Maintaining soil productivity and food security under the long-term fertilizer-based intensive cropping system and varying regional climate conditions is a critical concern both for China and globally. We hypothesize that intensive land use with increased fertilizer use for high grain production on the limited cropland in China, especially during the last 20 years, has influenced the long-term soil productivity, which will in turn have an impact on sustainable food production. 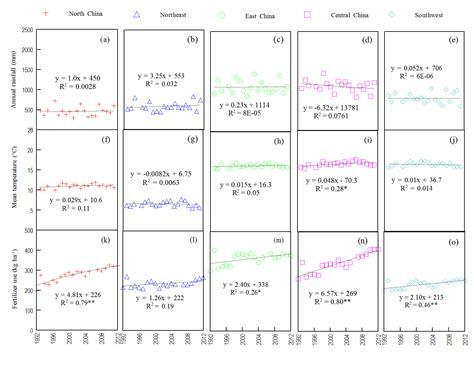 This paper, based on China Statistical Yearbooks 1993-2013, analyzes the trends in regional major grain yields, including the three major grain crops of rice (Oryza sativa), wheat (Triticum aestivum) and maize (Zea mays), associated with fertilizer use in the three major grain croplands and annual climate variation in rainfall and mean temperature over the last 20 years, and assesses the changes in the soil-based productivity of Chinese grain croplands in the major grain-producing regions in North China, Northeast China, East China, and Central & Southwest China. The assessment provides information on (i) trends in regional grain yield responses to fertilizer use over time, and (ii) changes in regional soil-based productivity under intensive grain production conditions. The aim of the study is to gather useful information to guide regional soil nutrient management practices that can sustain soil productivity and enhance crop production capacity under varying regional climate conditions to meet the grand challenge of food production security, health and sustainable development. The research sites were located in the 13 major grain-producing provinces, distributed in the following five regions: (1) North China (NC): Hebei, and Inner Mongolia; (2) Northeast China (NE): Heilongjiang, Jilin, and Liaoning; (3) East China (EC): Anhui, Jiangsu, Jiangxi, and Shandong; (4) Central China (CC): Henan, Hubei, and Hunan, and (5) Southwest China (SW): Sichuan (Figure 1). A brief description of the research sites is given in Table 1, which includes soil type, climatic characteristics, major grain crops (including rice, wheat and maize), for each of these provinces, using statistical data averaged from 1992 to 2012, based on China Statistical Yearbooks (NBSC, 1993-2013). 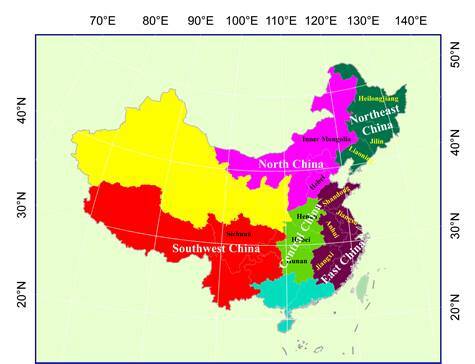 Figure 1: Map of the research sites in the 13 major grain-producing provinces in China in five regions: (1) Northeast China (NE): Heilongjiang, Jilin, and Liaoning; (2) North China (NC): Hebei, and Inner Mongolia; (3) East China (EC): Anhui, Jiangsu, Jiangxi, and Shandong; (4) Central China (CC): Henan, Hubei, and Hunan; and (5) Southwest China (SW): Sichuan provinces. Table 1: Characteristics of the 13 major grain-producing provinces, data over the period 1992-2012 (Source: National Bureau of Statistics of China, 1993-2012). † Soil classification based on ISS-CAS (2003). In China’s 31 provinces, autonomous regions, and municipalities directly under the central government, there are 13 major grain producing regions. According to national statistical data in 2012 (NBSC, 2013), the total major grain (including rice, wheat and maize) production accounted for about 90% of the national total grain production. The major grain production in the top 13 major grain-producing provinces accounted for 77% of the national total major grain production, accounting for about 10%, 19%, 24%, 20%, and 5% of the national total, respectively, for NC, NE, EC, CC, and SW. The statistical data including fertilizer inputs, major grain yields, and annual climate data in the five regions (NC, NE, EC, CC, and SW) involved in the 13 grain-producing provinces for the period 1992-2012 were gathered from the China Statistical Yearbooks (NBSC-2013). Data for fertilizer inputs include the total NPK (N+P2O5+K2O) nutrient inputs from nitrogenous, phosphate, potash and compound fertilizers. Data for major grain yields include the total grain yields of three grain crops, including rice, wheat, and maize. Data for annual climate variability include the data of annual rainfall (AR) and annual mean temperature (AMT). 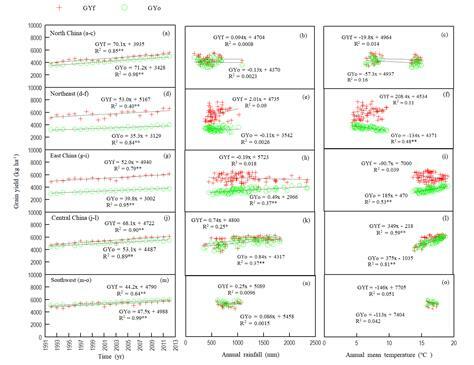 The data were used to analyze the trends in regional grain yields (GY) associated with fertilizer use (F) and annual climate variation in AR and AMT over the last 20 years, and to assess the changes in the regional grain yield responses to fertilizer use. They were also used to estimate the partial factor productivity of applied fertilizer (PFP). and b0, b1, b2, b3, and b4= coefficients. where GYf & GYo are grain yields with & without fertilizer (F), and △GY is the incremental yield increase that results from fertilizer use (△GY = GYf - GYo). △GY/F defined as the agronomic fertilizer-use efficiency (AE) is the incremental efficiency from applied fertilizer (in kg yield increase per kg fertilizer use) or proportional to the benefit-cost ratio from investment in fertilizer inputs (Novoa and Loomis, 1981). GYo/F is a mathematical term derived from separating the yield supported by indigenous nutrient from that obtained in response to fertilizer use (Cassman et al., 1996). Based on China Statistical Yearbooks (NBSC, 1993-2013), the trends in regional sown area: the total sown area, and the major cropland area (including rice, wheat and maize cropland), and the regional grain production: the total grain production, and the major grain production are shown in Figure 2. The major cropland area % of the total sown area changed from 51% to 57%, 58% to 70%, 59% to 62%, 59% to 56%, and 56% to 48%, respectively, for regions NC, NE, EC, CC, and SW during 1992-2012, while the major grain production of the total grain production changed from 82% to 88%, 84% to 91%, 89% to 95%, 92% to 95%, and 81% to 81%, respectively. 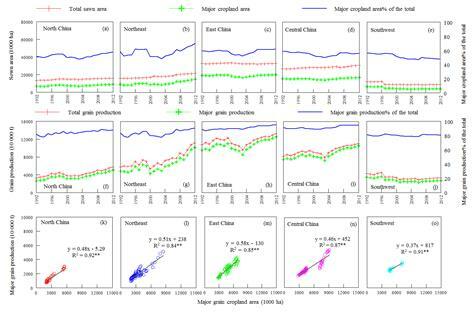 The results showed that the changes in the major grain production were significantly influenced by the changes in major cropland area for the five regions (Figure 2). Figure 2: Trends in the regional sown area (a-e): the total sown area, the major cropland area (including rice, wheat and maize cropland), and the major cropland area % of the total sown area; the regional grain production (f-j): the total grain production, the major grain production, and the major grain production % of the total grain production, as well as the relationships between the changes in the major grain production and the changes in the major cropland area (k-o) in North China, Northeast China, East China, Central China, and Southwest China during 1992-2012 (Source: National Bureau of Statistics of China, 1993-2013). Based on the statistical data (NBSC, 2013), the major grain production for regions NC, NE, EC, CC, and SW changed by about 40%, 30%, 10%, 10%, and -18% from 1992 to 1998, but decreased by 15%, 22%, 19%, 13%, and 16% from 1998 to 2003, and then increased by 62%, 107%, 48%, 47%, and 11% from 2003 to 2012, respectively. Data on yield trend analysis showed China’s grain yield per unit area reached record highs in 1998, but has stagnated since then; this was mainly attributed to the rapidly growth in agricultural fertilizer consumption since the end of the 1980s (Xin et al., 2012). Based on the Statistical Yearbooks (NBSC, 2013), the changes in fertilizer use and annual climate variability in AR and AMT in the major grain-producing regions over the last 20 years are shown in Figure 3. During 1992-2012, annual variations in AR were large, ranging from 177 to 1097, 385 to 1037, 456 to 2367, 355 to 1824, and 611 to 1060 mm, respectively, for NC, NE, EC, CC, and SW, correspondingly with coefficients of variation (CV) of 38%, 24%, 38%, 36%, and 16%%, while annual variations in AMT ranged from 6.5 to 15.0, 4.4 to 9.7, 13.8 to 19.2, 14.0 to 18.8, and 15.8 to 17.4 ℃, respectively, correspondingly with CVs of 31%, 28%, 8%, 8%, and 3%. The fertilizer use on weighted average changed from 198 to 324, 217 to 268, 302 to 379, 263 to 412, and 205 to 255 kg ha-1, respectively, for NC, NE, EC, CC, and SW during 1992-2012, corresponding to average increase rates of 4.8, 1.3, 2.4, 6.6, and 2.1 kg ha-1 year-1 (Figure 3). Figure 3: Trends in annual rainfall (AR, mm) (a-e), annual mean temperature (AMT, ℃) (f-j), and fertilizer use (F, kg ha-1) (k-o) in North China, Northeast China, East China, Central China, and Southwest China during 1992-2012 (Source: National Bureau of Statistics of China, 1993-2013). The statistical models for analysis of regional yield-influencing factors (in Table 2) could satisfactorily explain the increasing trends in regional grain yields (GY) over the last 20 years, in responses to fertilizer inputs (F), annual climate variability in AR and AMT, and year-time variable (YR), accounting for about 80%, 59%, 61%, 83%, and 70% of yield variability, respectively, for regions NC, NE, EC, CC, and SW. The regional grain yields increased over the last 20 years, which were significantly related to time variable by year changes and generally responded positively to fertilizer use as assessed using multiple regression analysis (Table 2). The average yield responses to increased fertilizer rates (with regression model coefficients, in kg kg-1) were in the order: NE (9.3) > EC (5.7) > NC (1.7) > CC (1.1) > SW (-0.9) during the period 1992-2012, while the average rates of fertilizer increase were in the order (in kg ha-1 year-1): NE (1.3) < SW (2.1) < EC (2.4) < NC (4.8) < CC (6.6) (Figure 3), showing significantly higher yield responses to fertilizer use for NE and EC than for other regions. The changes in regional yields were not affected by AR, except for CC, but significantly positively related to AMT for CC and EC but not for NC, NE, and SW, correspondingly with regression model coefficients (in kg C-1) of 272, 128, -68, -136, and -48 (Table 2), indicating that yields in some regions might be more sensitive to AMT and AR than fertilizer (such as in CC). Table 2: Coefficients of the regression models for regional major grain yields (GY), as function of fertilizer (F), annual rainfall (AR), annual mean temperature (AMT), and year-time variable (YR), in North China (NC), Northeast China (NE), East China (EC), Central China (CC), and Southwest China (SW) for the period 1992-2012 (Source: National Bureau of Statistics of China, 1993-2013). 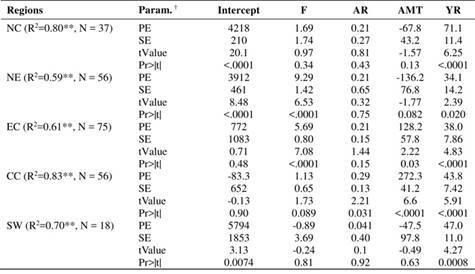 †PE = Parameter Estimate; SE=Standard Error; Pr = probability-value (P-value). The annual variations in the soil-based productivity (GYo) were also calculated as a function of F (where F=0), AR, AMT, and YR using the statistical models based on the equations in Table 2, then compared to the fertilizer-based yields (GYf) from the Statistical Yearbooks in the five regions (Figure 4). The changes in GYo on weighted average from 1992 to 2012 ranged from 3542 to 5004, 3216 to 4026, 2964 to 3781, 4441 to 5506, and 5079 to 6006 kg ha-1 for NC, NE, EC, CC, and SW. Both GYf and GYo for the five regions increased from 1992 to 2012, while the average increase rates (in kg year-1) in NC, NE, EC, CC, and SW were 70, 53, 52, 68, and 44 for GYf, as compared to 71, 35, 40, 53, and 48 for GYo, respectively (Figure 4). The GYf and GYo for the period 1992-2012 were significantly positively correlated for NC, CC, and SW (R2 = 0.72**, 0.80**, and 0.44**, respectively), but not for EC and NE (Figure 5). 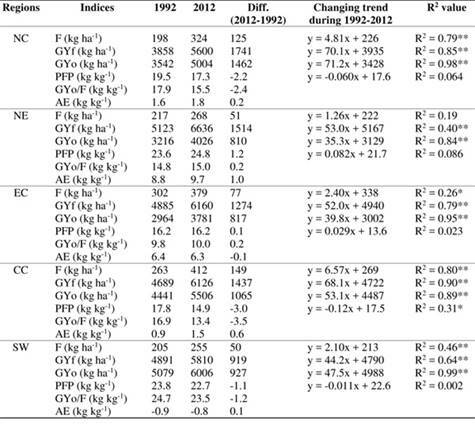 Figure 4: Changes in fertilizer-based grain yields (GYf, grain yield with fertilizer added based on China statistical yearbook 1993-2013), and soil-based productivity (GYo, grain yield without fertilizer added estimated based on the equations in Table 2), in responses to time (year, YR), annual rainfall (AR) and annual mean temperature (AMT) in North China (NC, a-c), Northeast China (NE, d-f), East China (EC, g-i), Central China (CC, j-l), and Southwest China (SW, m-o) for the period 1992-2012. The annual variations in PFP (fertilizer partial factor productivity) for the five regions were showed in Figure 5. During 1992-2012, PFP on weighted average changed from 19.5 to 17.3, 23.6 to 24.8, 16.2 to 16.2, 17.8 to 14.9, and 23.8 to 22.7 kg kg-1, respectively, for NC, NE, EC, CC, and SW, as fertilizer use increased over time. There were significantly negative relationships between regional PFP and fertilizer use from 1992 to 2012 (Figure 5). There were significantly positive relationships between PFP and GYo for NE, EC, and CC, but not for NC, and SW (Figure 5). Figure 5 Changes in fertilizer partial factor productivity (PFP), in responses to time (year, YR), fertilizer rate (F) and soil-based productivity (GYo), and relationships between fertilizer-based grain yields (GYf, grain yields with fertilizer added based on Statistical Yearbook 1992-2012) and soil-based productivity (GYo, grain yields without fertilizer added estimated based on the equations in Table II) in North China (NC, a-c), Northeast China (NE, d-f), East China (EC, g-i), Central China (CC, j-l), and Southwest China (SW, m-o) for the period 1992-2012. Table 3 showed that the changes in PFP, and its two components (AE and GYo/F) between 1992 and 2012. Such as in 2012, weighted average PFP (in kg kg-1) followed the order NE (24.8) > SW (22.7) > NC (17.3) > EC (16.2) > CC (14.9), where the AE component (in kg kg-1) of NE (9.7), SW (-0.8), NC (1.8), EC (6.3) and CC (1.5), respectively, as compared to the GYo/F component (in kg kg-1) of NE (15.0), SW (23.5), NC (15.5), EC (10.0), and CC (13.4) accounted for about 61%, 103%, 89%, 61%, and 90% of PFP. Table 3: Regional mean fertilizer rate (F), major grain yields with and without fertilizer (GYf and GYo), fertilizer partial factor productivity (PFP = GYo/F + AE), and PFP components (GYo/F and AE, where AE = △GY/F), in North China (NC), Northeast China (NE), East China (EC), Central China (CC), and Southwest China (SW), using statistical data weighted averaged over 1992-2012 (Source: National Bureau of Statistics of China, 1993-2013). According to an investigation in China, using the national agricultural sub-county data and the second national soil survey data, the proportion of low-yield farmlands had decreased from 50% to 29% from 1985 to 2008, while the medium- and high-yield farmlands had increased from 25% to 38% and from 25% to 34%, respectively (Shi et al., 2010). However, the low- and medium-yield farmlands in China are still large (about 66%), mainly distributed in Northeast China, North China, and the lower-middle reaches of Yangtze River (Shi et al., 2010). It is important to understand the impacts of a continuous increase in fertilizer use on regional yield differences and yield trends, and the implications that these effects may have for increasing yield potentials by improving the low-medium yield farmlands and sustaining soil productivity in the major food production regions of China. The regional yield differences and yield trends may be attributable to a number of factors such as agro-ecological zone, crop type, high-input compared with low-input level practices, and management experience (Zundel and Kilcher, 2007). 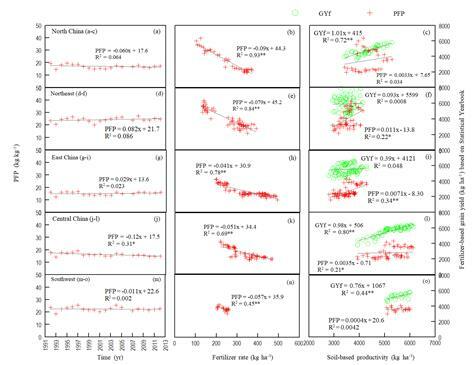 In our study, changes in both GYf (fertilizer-based yields) and GYo (soil-based productivity) for the five regions showed significant increasing trends over time from 1992 to 2012 (Figure 4). The significantly positive relationships between GYf and GYo for the period 1992-2012 for NC, CC, and SW, but not for NE and EC (Figure 5), could explain higher yield responses to fertilizer use for NE and EC than for NC, CC, and SW (Table 2), while other factors, such as annual climate variability for CC (Figure 4, and Table 2) and soil-based productivity (or inherent soil productivity) for NC, CC, and SW, could be more important than fertilizer in affecting yields. The regression analysis of regional yield-limiting factors for the period 1992-2012 also showed that fertilizer appeared to be a more important yield-limiting factor for regions NE and EC than for NC, CC, and SW, while yields in some regions especially for CC showed more sensitive to annual climate variability (both AMT and AR) than fertilizer (Table 2). The increasing trends in regional yields were significantly related to year-time variable (Table 2), indicating that annual variations in yields may also be attributed to some other factors, probably due to increased soil fertility or water availability related to improved farming practices. With recurring application of mineral fertilizers matched to yield demands, soil fertility in China has improved in terms of soil nutrient status, but also soil organic carbon (SOC) since the 1980s (Sun et al., 2010). However, as several long-term field studies observed, excessive soil fertility, especially N fertilizer over-inputs in North China and East China caused nutrient imbalances, contributing to acidification, and decreasing C/N ratios (Darilek et al., 2009; Peng, 2011), but also resulting in a reduced yield response to continuously increasing chemical fertilizer use (Huang et al., 2010). As Tian et al. (2012) suggested, the continuous rise in N fertilization rate might not stimulate C accumulation in agricultural soils further because crop productivity in response to N addition has begun to decline in large areas of China, resulting in less C entering into the soil. The index of PFP (fertilizer partial factor productivity), a useful parameter for identifying constraints to improved fertilizer-use efficiency in farmers' fields, includes two components, GYo/F and △GY/F (or AE, agronomic fertilizer-use efficiency). The terms included are related to the availability of indigenous soil nutrient supply and fertilizer applied, respectively (Cassman et al., 1996). Quantification of the contributions of these two components to PFP provides a more complete understanding of long-term productivity trends and fertilizer-use efficiency (Olk et al., 1999). Cassman et al. 1996 suggested that PFP can be increased by increasing the amount, uptake and utilization of indigenous nutrients, and by increasing the efficiency with which applied nutrients are taken up by the crop and utilized to produce grain. High yields and high PFP in the regions result from a combination of fertile soils, favorable climate, and improved crop and soil management practices, including fertilizer management (Dobermann, 2005). The statistical data analysis for 1992-2012 showed that the weighted average PFP (in kg kg-1) followed the order (such as in 2012) NE (24.8) > SW (22.7) > NC (17.3) > EC (16.2) > CC (14.9) (Table 3), where the GYo/F component (in kg kg-1) of NE (15.0), SW (23.5), NC (15.5), EC (10.0) and CC (13.4) accounted for about 61%, 103%, 89%, 61%, and 90% of PFP, respectively, as compared to the AE component (in kg kg-1) of NE (9.7), SW (-0.8), NC (1.8), CC (1.5), and EC (6.3). This showed that the GYo/F component accounted for most of PFP, reflecting a higher indigenous soil nutrient supply contribution to yields compared to AE. Results showed that PFP was negatively related to fertilizer use for the five regions, but positively to GYo for NE, EC, and CC but not for NC and SW (Figure 5). This suggests that higher GYo due to indigenous soil fertility may not result in high PFP, while high PFP may be attributed to the balance between indigenous soil nutrient supply and fertilizer applied, rather than fertilizer over-use and resulting excessive soil fertility. The GYo (in kg ha-1) followed the order SW (6006) > CC (5506) > NC (5004) > NE (4026) > EC (3781) during the period 1992-2012 (Table 3). Over the same period, the average fertilizer increase rates (in kg ha-1 year-1) were in the order of CC (6.6) > NC (4.8) > EC (2.4) > SW (2.1) > NE (1.3) (Figure 3), while yield responses to fertilizer rates (with regression model coefficients, in kg kg-1) were in the order: SW (-0.9) < CC (1.1) < NC (1.7) < EC (5.7) < NE (9.3) (Table 2). The values of AE (in kg kg-1), one of two components of PFP (in 2012) were SW (-0.8) < CC (1.5) < NC (1.8) < EC (6.3) < NE (9.7), similar to the model coefficients of yield responses to fertilizer, showing higher yield responses to fertilizer use for NE and EC than for other regions. A study in China showed that the indigenous nutrient supply was much higher than previously determined, indicating that over-application of fertilizers in many regions of China has increased both residual nutrients and the potential for losses into the environment (Chuan et al., 2013). Fan et al. (2013) observed that higher yields in control plots led to a higher relative contribution of inherent soil productivity to the total production. A high indigenous nutrient supply in relatively high fertility soils generally resulted in high relative yield (GYo/GYf) but low yield response to fertilization and low agronomic fertilizer-use efficiency (AE) (Chuan et al., 2013). In contrast, a low indigenous nutrient supply in relatively low fertility soils could result in low relative yield but relatively high yield response to fertilizer application and high AE (Zeng et al., 2012). In other words, high inherent soil productivity may lead to low yield response to fertilizer application and low fertilizer-use efficiency, unless fertilizer application rate is adjusted to account for soil nutrient supply. As for N fertilizer management, Khan et al. (2007) suggested that fertilization beyond crop requirements could be reduced substantially by a shift from the current yield-based N management that is advocated for short-term economic gain, to soil-based N management, ideally implemented on a site-specific basis by assessment of soil N availability. Roberts (2008) suggested that though perspectives vary, agronomic nutrient use efficiency is the basis for economic and environmental efficiency, while there must be a balance between optimal nutrient use efficiency and optimal crop productivity. As agronomic efficiency improves, economic and environmental efficiency will also benefit. As some reported, regional crop yield responses to fertilization can vary from year to year due to variation in weather conditions, but also because of indigenous nutrient supply, and interactions of climate variability and nutrient management (Trnka et al., 2012). High yields and high PFP usually result from a combination of fertile soils, favorable climate, and improved soil nutrient management practices (Dobermann, 2005). However, because climate is the major uncontrollable factor that influences crop yield, it is difficult, but necessary to separate the effect of changes in climate over time from other yield drivers such as the increased use of modern inputs and intensified crop management (Gu, 2003), but also soil quality, genetics, and land management (Licker et al., 2010), to help in developing region-specific fertilizer management practices to reach an optimal, and sustainable level (Darilek et al., 2009) under varying regional climate conditions. In our study, the statistical models only considered some limited yield-influencing factors, such as fertilizer use, annual climate variability in AR and AMT, and year variable, which may cause some uncertainties in analyzing regional yield differences and fertilizer-use efficiencies. However, regional yield or fertilizer efficiency improvement may be also influenced by some other factors, such as increased soil fertility or water availability (Trnka et al., 2012) related to improved farming practices, including use of modern crop varieties, alternative tillage measures, supplemented irrigation, added organic manure, and crop straw or adjusted NPK nutrient input ratios (Zundel and Kilcher, 2007; Darilek et al., 2009; Huang et al., 2010; Licker et al., 2010; Lu et al., 2010; Mahmood et al., 2017; Zhang et al., 2017). Regional grain production was also affected by the changes in regional crop sown areas and crop structures (Figure 2), for instance, the changes in crop structures or crop types between south (more rice) and north regions (more wheat and maize) may cause differences in regional yields and fertilizer-use efficiencies, due to crop nutrient requirements, fertilizer use intensities, and fertilizer-use efficiencies between C4 crops (maize) and C3 crops (rice and wheat). Therefore, the regional yield data analysis with statistical models still need to have local farm surveyed data or field experiment data to calibrate to help reduce some uncertainties in evaluating regional yield differences or fertilizer-use efficiencies. The agronomic fertilizer-use efficiency (AE, in kg kg-1) were in the order: SW (-0.8) < CC (1.5) < NC (1.8) < EC (6.3) < NE (9.7), showing higher yield responses to fertilizer use for NE and EC than for other regions. There were higher yield responses to soil-based productivity (or inherent soil productivity) for NC, CC, and SW, or to annual climate variability for CC than for other regions. The PFP (fertilizer partial factor productivity) analysis suggested that the relative contribution of indigenous soil nutrient supply to productivity (GYo/F component) was higher than the productivity attributed to fertilizer application (AE component). Therefore, increasing PFP depends on modifying fertilizer rates based on indigenous soil nutrient supply to avoid fertilizer over-use and the resulting excessive soil fertility, by adjusting nutrient inputs to more closely match crop demands, and thus improve AE. In our study, the statistical models only considering some limited yield-influencing factors, such as fertilizer use, climate variability in annual rainfall and annual mean temperature, and the year variable. However, regional yield or fertilizer efficiency improvement may be also influenced by some other factors. Further studies in evaluating regional yield differences or fertilizer-use efficiencies still need to have local farm surveyed data or field experiment data for calibration to reduce some uncertainties.